Vertical Vacuum Packing Machine not only can do the process of sealing, but also vacuum extraction or inert gas flushing after vacuum cycle. Vertical Vacuum Packing Machine is suitable for package which has low demand on vacuum degree but high demand on the purity of inert-gas. 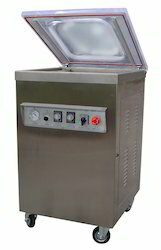 Vertical Vacuum Packing Machine is not limited by the size of vacuum chamber. Single Chamber Vacuum Packing Machine is available in Models SPVP 400, SPVP 500 and SPVP 600 can finish the whole programs of vacuum extraction, gas flushing (optional), sealing, cooling and exhaust automatically. The products after packing by Single Vacuum packing machines can be prevented from oxidation, going mold, insects or getting damp, thus can be kept fresh for longer time. The products after packing by Single Vacuum packing machines can be prevented from oxidation, going mold, insects or getting damp, thus can be kept fresh for longer time. 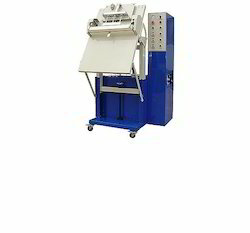 Single Chamber Vacuum packing machines are useful for packing of meat products, seafood, medicine, electronic components, hardware's, and medical instruments etc. By keeping track with the latest trends, we are bringing forward an attractive range of Table Top Vacuum Packing Machine to our precious clients. This equipment eases the labor's work and helps in preventing the drudgery of manual handling as well as other risk factors which contribute towards incurring unneeded costs. 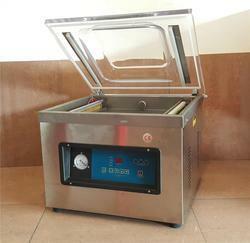 It has functions of automatic heat seal, automatic template, manual discharge tray, etc. 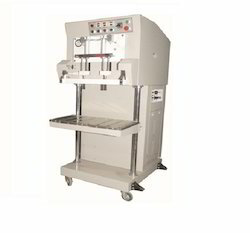 This machine adopts intelligent temperature controller, which can be adjusted as per the packing requirements. The overall rate of temperature error is less, whereas the packaging strength and gas exchange rates are higher. This machine is helpful in acquiring accurate results and decreasing the overall investment cost of your company. Leveraging on our vast industry experience, we are providing a high-quality range of Double Chamber Vacuum Packing Machine. The products after packing by Double Chamber Vacuum packing machines can be prevented from oxidation, going mould, insects or getting damp, thus can be kept fresh for longer time. SPVP-500/2S Double chambers vacuum packaging machine can complete the set programs of vacuum extraction, gas flushing (optional), sealing, printing, cooling and exhaust automatically. The products after packing can be prevented from oxidation, going mould, insects or getting damp, thus can be kept fresh for a longer time. Double chambers vacuum packaging adopt “BUSCH” vacuum pump. Double Chamber Vacuum packing machines are useful for packing of meat products, sea food, medicine, electronic components, hardware's, and medical instruments etc. 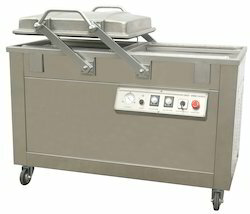 Looking for Vacuum Packing Machine ?